picture shows a MG42 bolt-head with square extractor plunger turned upside down on a correct WW2 carrier with solid feed-stud. The MG3 carrier has been redesigned to make this impossible to do. Its the part that moves the round from the feed-tray into the barrel , ignites the primer , and ejects the empty shell from the gun before starting the cycle over again. It rides in a track inside the rear of the receiver. This track is created by the riveting of rails to each side of the receiver. The rails then form a guide that supports the bolt and allows it to reciprocate between the barrel and the buffer. It doesn't "attach" exactly as it needs to be able to move freely inside the receiver. As described above its held captive in a track created by the rails that only allow the bolt to move forward and back. What are the different types of bolts ? MG2/3 the new and improved version with a round extractor plunger & spring loaded feed-stud. 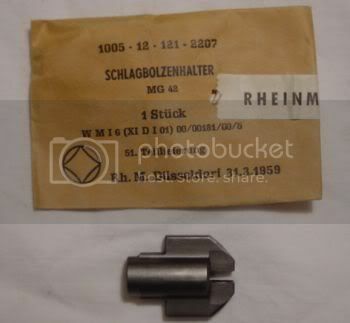 The first picture shows the MG42 style bolt-head with the square extractor plunger . The second picture shows the MG3 style bolt-head with the round extractor plunger . What do the different bolts look like ? 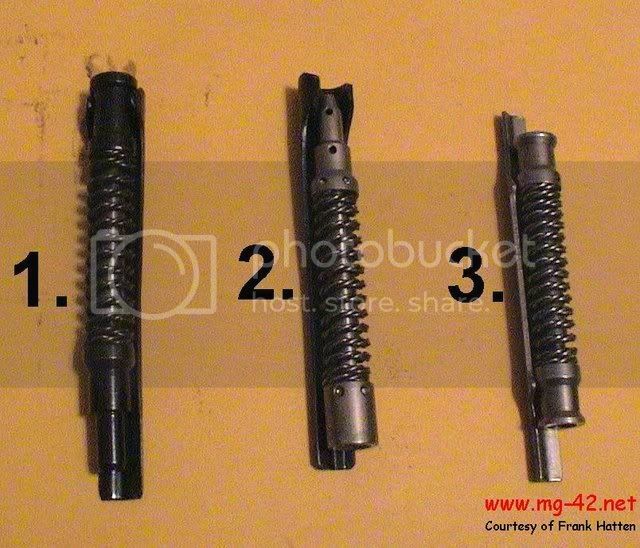 Here is a picture showing bolt carriers ,FA on the left - top to bottom, a MG42 , MG3 ,MG3 heavy. 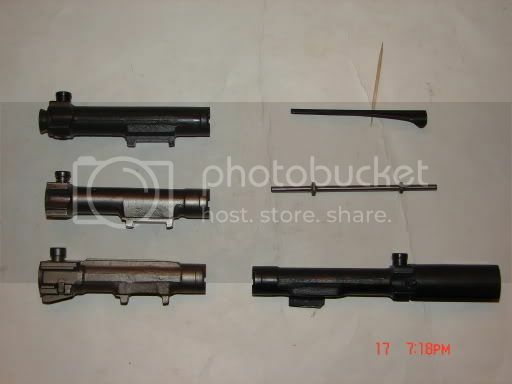 on the right a semi-auto bolt modified by pirate shown with its firing pin striker & ejector actuator. 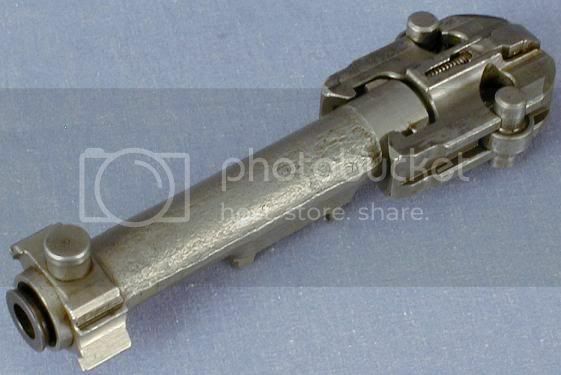 Shown below is an swiss MG74 VERY heavy bolt designed to slow the guns rate of fire. Which types of bolts are compatible with which guns ? Yugo or German bolts will function the same in either receiver. FA bolts will only work in FA receivers and SA bolts will only work in SA receivers. 7B) bolt extension (semi-auto only) not shown in diagram. Are all the internal parts compatible ? The Extractor plungers and plunger springs (#s 1B , 1C) come in two types round and square, and will only fit the correct bolt-head. They are 100% not interchangeable. The pieces you need to modify to work in a semi-auto (#s 2 , 2A , & 3) will not work with a FA gun and those parts should-not / cannot be used in a semi if unaltered . Some SA bolt modifications are designed to only work with certain varieties of the ejector actuator (#5) . Some SA bolts will work with the original firing pin / striker combo and some replace it with a one piece pin. shown are the two types of ejector actuators. 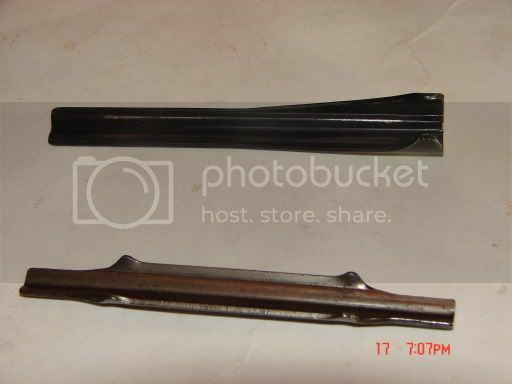 MG42 " spoon" style on top, MG3 style on the bottom. What modifications are required to convert the bolt to work in the semi-auto SA42 ? 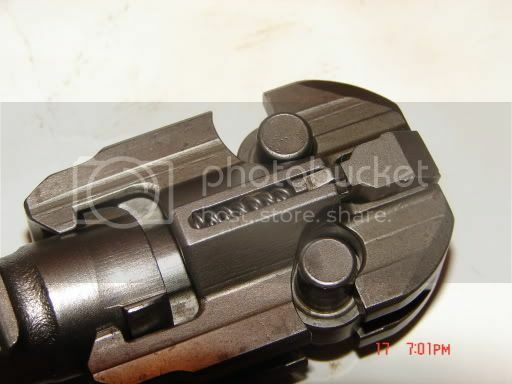 The first modification is the removal of the full-auto sear lugs on the bottom of the bolt carrier. 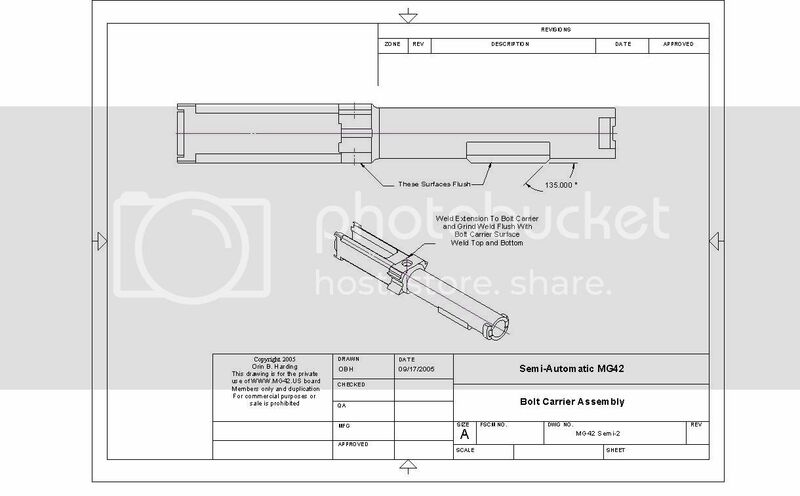 shown in this diagram provided by member 7.62 X 51 .
you will need to have the correct size hole drilled through the striker shown below and the feed-stud to allow the semi-auto firing pin to be inserted into the bolt. 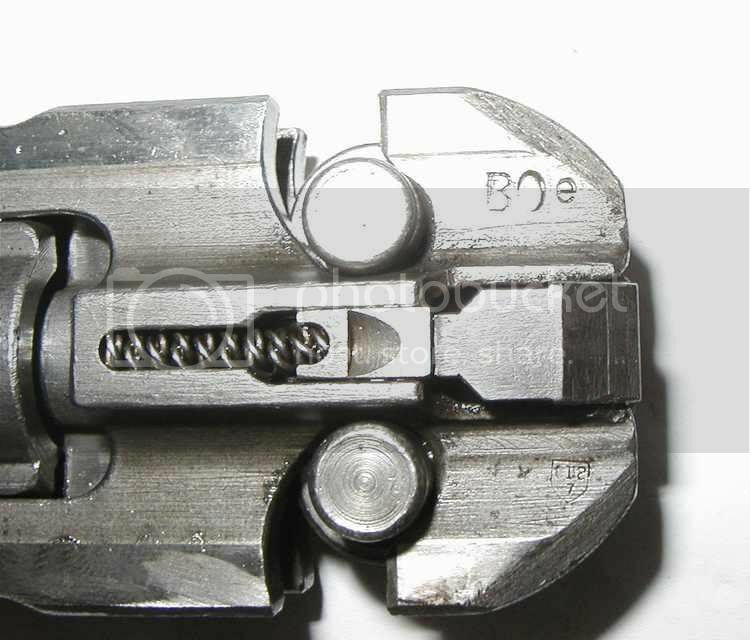 one piece semi-auto firing pin shown below made by member panaceabeachbum. The next modification is the addition of a bolt extension to hold the recoil spring away from the rear of the bolt and allow the hammer to be able to strike the firing pin. shown in this diagram also provided by member 7.62 X 51 . Finally you will need to weld a "sail panel" to the right side of your bolt to be engaged by the cocking handle to charge the firearm. Who can modify the full-auto bolt that came with my kit into a semi-auto for me ? are members here on this forum that can help you to modify your bolt . 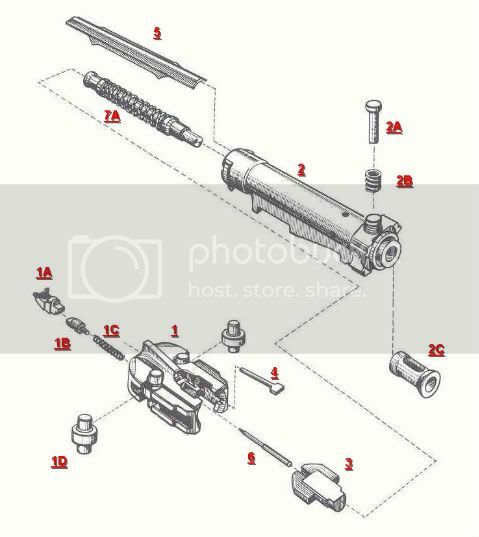 What modifications are required to convert the MG3 Bolt with the spring loaded feed-stud to work with the a semi-auto receiver ? Currently no one offers a semi-auto bolt with a spring loaded feed-stud. or send it to panaceabeachbum as his modification replaces that part. What modifications are required to convert the MG3 heavy Bolt to work with the a semi-auto receiver ? To my knowledge as MG3 heavy Bolts and the experimental VERY heavy bolt are rare and sought after parts no one has tried to modify them yet . I think there would be no good reason to modify them as the extra weight is designed to slow down the rate of fire in a FA gun. Better to sell them to a collector or FA owner and get a normal bolt. Disclaimer..... All information provided here is strictly for legal use and is presumed to be accurate. It is solely YOUR responsibility to verify any information or measurements as we assume no liability for what you do with this information or any injuries that might result. Pictures not belonging to MG42.US were obtained from public domain , if you claim copyright infringement by any of the pictures please contact a moderator . Last edited by drooling idiot on Sun Mar 18, 2007 4:29 pm, edited 1 time in total. Great info! Just what I was looking for. Tell me more about the bolt stabilizer , part 7A. There are three types of this part currently available. they are shown in this picture. Number one is the longest , it pre-loads the bolt because the spring is always compressed. This feature is reported to increase wear on the parts but offers the most force to maintain a positive lock-up of the bolt to the barrel. Its also shown laying on the "spoon" style ejector bar backwards. Number two, is more common it offers good performance with less wear. it relies more with its weight to act as a hammer to hold the striker (part 3) forward at the moment of FA ignition. It is shown correctly on top of its "spoon " style ejector. Number 3. its the modern version. This version relies completely on its weight to slide forward and hold the striker from bouncing out of lock-up for the 1/20th of a second it takes a FA to fire a round. It has no front or back to misassemble and uses a flat style ejector bar. 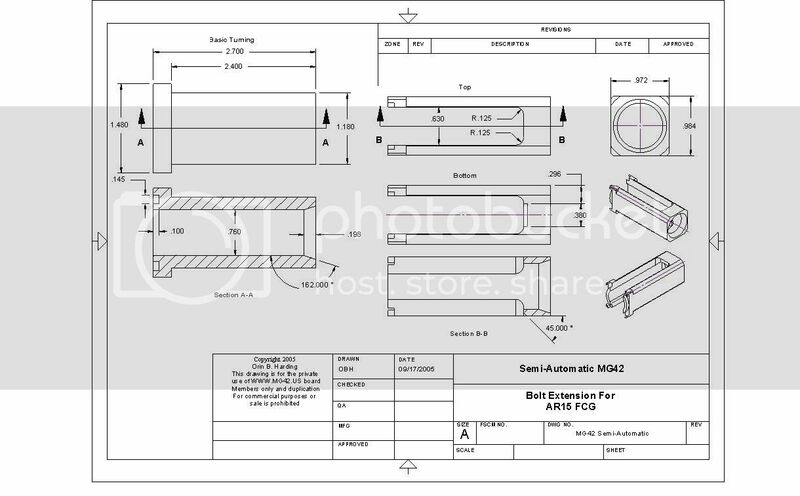 Great post DI, the dimentions in the bolt extension drawing are incorrect though. Pirate wrote: Great post DI, the dimentions in the bolt extension drawing are incorrect though. Provide me with the corrected dimensions and I'll update the drawing for drooling. If I remember correctly the buffer dia is .960" - 980" , so the ID should be abot 1". I don't know how that will affect the rest of the dimentions in the dwg. I have been looking for instructions on how to remove the roller pin on top of the bolt for an M53.